AEZs: FAO System | Infonet Biovision Home. Agro-ecological zones (AEZs) are land units defined on the basis of combinations of soil, land form and climatic characteristics. Agro-ecological Zoning (AEZ) refers to the division of an area of lend into smaller units, which have similar characteristics related to land suitability, potential production and environmental impact. 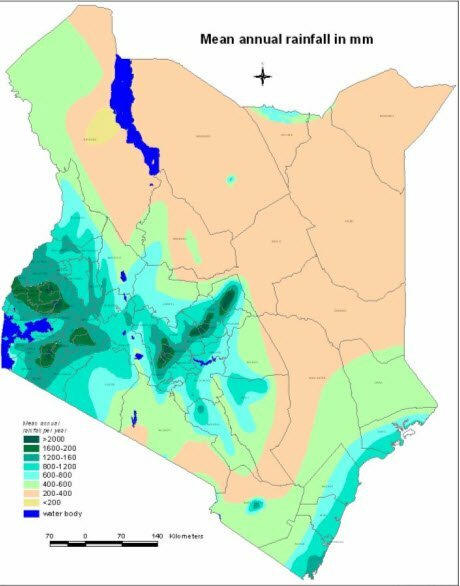 An Agro-ecological Zone is a land resource mapping unit, defined in terms of climate, landform and soils, and/or land cover, and having a specific range of potentials and constraints for land use. (FAO 1996).The essential elements in defining an agro-ecological zone are the growing period, temperature regime and soil mapping unit. 1. Zone groups are temperature belts defined according to the maximum temperature limits within the main crops in Kenya can flourish; cashew and coconuts for the lowlands, sugar cane and cotton for the lower midlands, Arabica coffee for the upper midlands (usually known as "Highlands" - the term "midlands" is used here to denote their central importance), tea for the lower highlands, pyrethrum for the upper highlands. The highest zone is high altitude rough grazing i.e. tropical alpine (or afro-alpine) vegetation. The threshold values of annual mean temperatures have been established along similar lines but supplemented by limiting factors for many crops e.g. mean minimum temperatures, frost, etc. 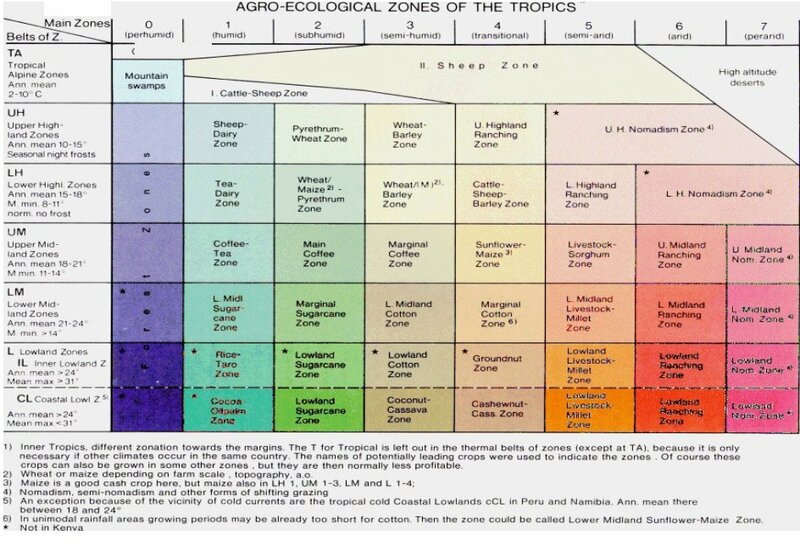 Agro-Ecological Zones 0-3 are originally zones of forest according to the natural vegetation. AEZ 4 corresponds to woodland, it is either deciduous in subzone with unimodal rainfall as towards West Kenya and in Tanzania, or hard-leaved evergreen in bimodal rainfall subzones with two dry seasons as in East Kenya, where plants have hard or hairy leaves to avoid shedding them off twice a year. The grass is up to 1 m high. AEZ 5 - the natural vegetation in is a short grass savannah with small leafed thorny trees and bushes. AEZ 6 is bush land with very short but still perennial grass, therefore it is suitable for ranching - if the grass (the standing hay for the dry season) is not eradicated by overgrazing. In AEZ 3 it is necessary to avoid burning which kills the regrowth of trees and ecologically valuable bushes. But the main danger here is overgrazing which puts the balance between grass and bushes to the bush side. Bush encroachment can finally finish the grazing potential. This is the same danger in AEZ 4 and 5 but with shrubby species (shrub encroachment, thorny in AEZ 5). In the first stage, poisonous or bitter herbs not eaten by livestock thrive abundantly, leading to some sort of "green degradation". In AEZ 6 the eradication of grass by overgrazing promotes at first dwarf shrubs (dwarf shrub encroachment), then in the better subzones thorny low shrubs grow up. The grazing potential has severely decreased, only goats as browsers remain. In a final stage, due to overuse and soil denudation, the shrubs disappear and desertification becomes evident. Reseeding fenced plots before it is so bad is now practised. Another problem that is aggravating not only the cropland but even the grazing land is soil degradation. The animals take in nutrients through the vegetal material they ingest and release the same through dung. Farmers need to utilize this dung on their fields in order to replenish the depleted soil nutrients. Sombroek, W.G., Braun, H.M.H. and van der Pouw, B.J.A. (1982). 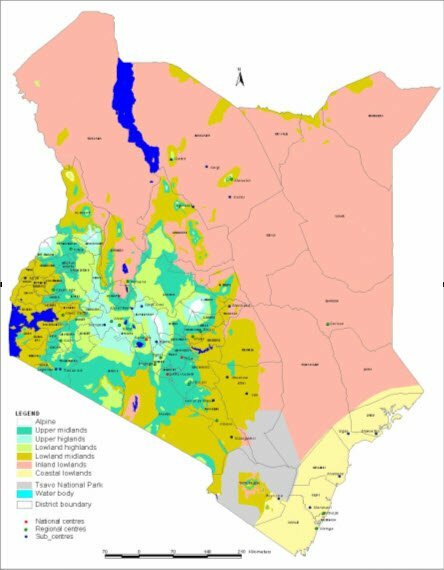 Exploratory Soil Map and Agro-Climatic Zone Map of Kenya, 1980. Scale: 1:1'000'000. Exploratory Soil Survey Report No. E1. Kenya Soil Survey Ministry of Agriculture - National Agricultural Laboratories, Nairobi, Kenya.